Exclusively for Big “I” members, Trusted Choice is the top brand for independent insurance agents. Trusted Choice is designed to amplify your local marketing and highlight the value that independent insurance agents bring to consumers. As a Big “I” member you automatically get access to materials that will benefit your business, provide you with consumer leads, and enhance your bottom line. Need help on where to start? All members get a free profile listing on the consumer-facing site, TrustedChoice.com, where over 6 million consumers visited in 2018. Even better, you can select the types of consumers you most want to reach. From logos to custom campaigns, Trusted Choice brand resources can boost your business. Connect your Agency brand with the National branding power of Trusted Choice by accessing a variety of logo options for use on website, print, and other marketing efforts. No time to create a marketing campaign for your Agency? Let us customize a campaign ad in a format of your choice, from radio, TV, and various print materials. Trusted Choice marketing materials are designed with your agency in mind, and our in-house designer will customize these materials for you. Access a full library of videos, graphics, and articles to share with current and potential customers. Looking for content for your social media or blogs? Access our database of pre-made consumer marketing materials including articles, social media posts, and infographics to share with potential and current clients. Sharpen your team's skills in advertising, customer service, and digital marketing. Gain a competitive edge through our education-rich training programs, reimbursement benefits, and referral support initiatives. Advertising 101 is a nine-part series designed to help you understand, design, and execute a successful advertising campaign. Learn about advertising goals, market research, budgeting, strategy, media, advertising agencies, ad content, and measurement. Is your website optimized? Need some help with social media? Our Digital Reviews provide a one-on-one consultation and detailed report on how you can improve your agency website and social media outlets. You’ll walk away with an actionable report that spells out your next steps. This service is included with your Trusted Choice membership – why not take advantage of it? The Power of 30 Seconds(TM) is a training series designed to help you maximize the experience of customers calling your agency on the phone. The training has 3 sections that focus on workflow, soft skills, and automation. Once you complete the training, feel free to take a short quiz and receive a certificate of completion. Whether you’re a digital rookie or a digital dominator, Agency Nation has the resources you need to take your marketing from now to next. With access to insider perspectives, articles, podcasts, and online digital marketing courses, Agency Nation’s marketing masters have walked in your shoes and offer expertise you can’t get anywhere else. Ready to kick it up a notch? Get reimbursed for co-branding marketing materials with the Trusted Choice logo. Trusted Choice will reimburse a portion of your marketing expenses for co-branding and in creating or updating a digital presence (website) to include the Trusted Choice logo. This is not meant to replace your agency’s brand, but to complement it by including the Trusted Choice branding in your marketing efforts. An Advantage Profile connects you with real insurance buyers in real-time, with one-to-one referrals. To grow your book of business, forget lead lists. 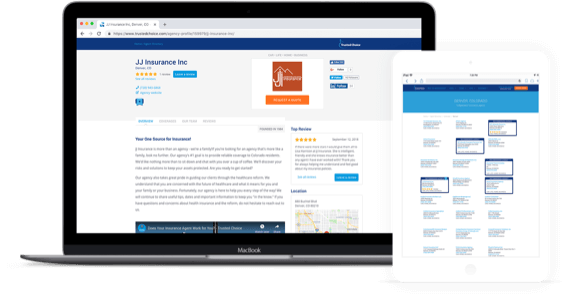 The digital Advantage profile connects real people with real insurance needs to the right local agent at the right time. Instead of you finding connections for the business you want to write, insurance prospects find you, based on the type of business you like to write. Now doesn’t that sound great?